To celebrate life in the big city, along with its 40th anniversary, the iconic storage company is adding quirky customer narratives to its history of eccentric advertisements. Rooted in engaging storytelling, the new campaign comes to life through two creative expressions – the debut of the brand’s first spokesperson, the Storage Guru, and “Manhattan Mini Stories” – a series of short films showcasing storage experiences of real customers, as interpreted by a cast of New York performers. The campaign was developed and produced in partnership with creative agency, Concept Farm, New York. 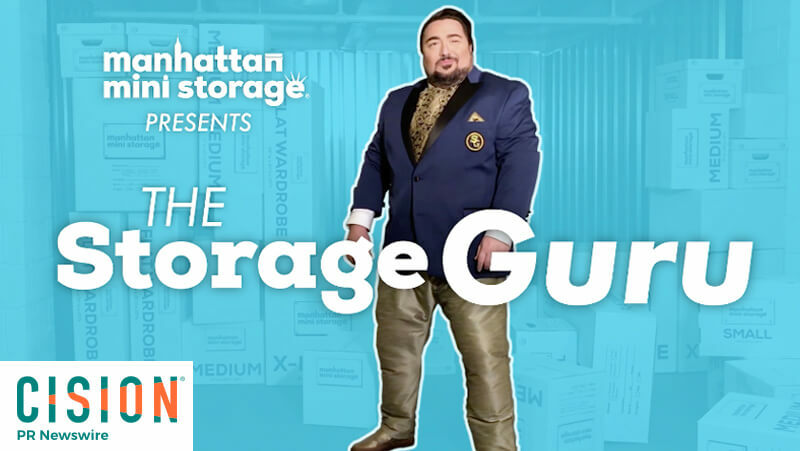 Uncluttering his mind, and his tiny West Village studio, decades ago, the Storage Guru offers sage advice to help hurried Manhattanites unpack their baggage and achieve storage nirvana. Pushing boundaries with sharp political commentary, a refined outfit selection, and a mystical spiritual journey, the Guru grabs the attention of city dwellers everywhere to continue his mission: pointing New Yorkers towards the path of enlightenment by freeing themselves from stress and clutter to fully maximize life in the Big Apple, all thanks to Manhattan Mini Storage. Spotlighting current customer stories, “Manhattan Mini Stories” brings quintessential New York experiences to life in a dramatic way with the help of local performance artists. With nearly one million customers storing a wide variety of business and personal belongings at Manhattan Mini Storage since its founding in 1978, the brand is highlighting four customer stories to show the heights and dreams achieved by listening to the Storage Guru — and with a little help from their storage unit. Nahabed and Jaime, whose epic “Super Storage,” tells of transitioning a lifelong comic book collection, as pantomimed by Broken Box Mime Theater. Manhattan Mini Storage strives to be a part of New Yorkers’ lives with de-cluttering solutions for all major milestones— whether their first apartment in the big city, supporting their own entrepreneurial dreams, or getting married and starting a family. The “Mini storage. Maximum you.” campaign highlights the ability to move freely in a city where everything seems transitory and find liberation from New York neurosis, clutter, and baggage (both emotional and physical). For more Manhattan Mini Stories and insights from the Storage Guru, follow Manhattan Mini Storage social channels or learn more online at manhattanministorage.com.